"Flowfinity provided a customized mobile solution that allows us to measure field sales team performance, results, and retail execution management." Kellogg's, one of the world's leading cereal and snack manufacturers, has a field sales team of over 3,000 in the US that is responsible for retail sales and in-store execution. The sales management team needed a standard and convenient way to report on the performance of sales reps on store visits, which was previously being documented on paper forms. The use of paper forms made it inconvenient to effectively track and provide feedback on sales reps' performance. It was also time consuming and labor intensive to input the handwritten data and generate reports from it. 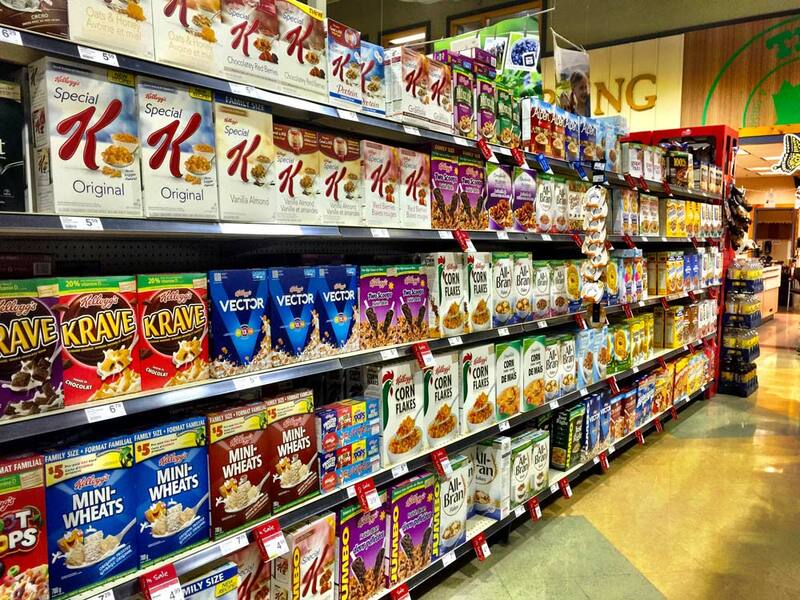 In addition to generating sales with customers, sales reps are responsible for ensuring that products are in-stock, priced and placed correctly, displays are compliant, and promotions are executed on time, so that consumers have a perfect in-store experience with the Kellogg's brand, every time. "The challenge we had was how to successfully track and manage the activities of thousands of individual sales reps and their managers, as well as store conditions, in a way that would positively impact sales," said Cindy Oliver, Sr. Manager Retail Strategy, Kellogg's. "We wanted a mobile solution that could capture all of this information from the field and provide a centralized method for storing and reporting on this critical data." Kellogg's was looking for software to create enterprise-class mobile apps. The solution had to be nimble enough to support app and form changes, flexible enough to automate different business process workflows, and robust enough to allow users to work with thousands of stores and SKU's efficiently on mobile devices, wherever they are. Advanced workflow capabilities were required to guide sales managers through the entire business process of setting up an employee evaluation, recording general observations, recording multiple store visits, reviewing results with the employee, finalizing and then filing the report for future reference during annual reviews. Kellogg's implemented a Flowfinity mobile solution for measuring and managing the performance of its field sales team. The solution allows sales managers to efficiently communicate priorities, and evaluate, train and improve the performance of the sales team in line with the company's "Perfect Store" objectives. Sales managers use Flowfinity apps on smartphones and tablets to work with sales reps before and during store visits. They record observations against expected performance criteria, and record store visit observations such as promotions, product displays, and other store conditions that affect sales. The information gathered on store visits is analyzed in weekly, monthly and quarterly reports. This delivers valuable performance metrics and helps ensure that each individual understands and excels in his or her role in achieving retail execution excellence with customers. "Flowfinity mobile apps enable us to measure the performance of our field sales reps, capture in-store conditions, provide valuable feedback, and improve retail execution to optimize sales," said Eric Gripentrog, VP, DSD Sales & Operations, Kellogg's. Kellogg's field sales reps are on the front lines in stores and with customers, and their performance is critical to driving revenue. Now the team has a way to standardize, score, capture objectives, and increase the transparency of store visit information. "Flowfinity provided a customized mobile solution that allows us to measure field sales team performance, results, and retail execution management," said Oliver. "It gives us an accurate document trail that we can use for coaching and communicating results to help improve each individual's performance." In the field, District Managers can look up past store visit reports for a particular employee and review them on the spot. Having well documented sales activity provides more incentive for sales reps to exceed their goals. "Our sales team members want to exceed expectations, and we can achieve that by measurement," said Robert Baker, District Manager, Kellogg's. "Our Flowfinity apps are designed so that when we're evaluating a particular sales rep's performance in a store, we can use scores and look up past objectives, and it takes a lot of the subjectivity out of it." The results are discussed with sales reps at performance reviews, whether mid-year, at the end of the year or before the next store visit. "The information we collect in Flowfinity provides a springboard for discussion points on in-store execution results along with the employee's current results on key metrics and priorities," said Baker. One of the advantages of using a mobile solution with email notifications is that it allows stakeholders to be sent critical information as it happens. At Kellogg's, when reports are submitted from the field, the manager, sales rep, and senior manager involved are all emailed a copy, ensuring transparency and real-time communication. The Flowfinity apps also make it more efficient to train new employees. When managers work with sales reps in stores, they can work with the app to guide the sales rep through pre-defined processes and cover critical in-store conditions that should be managed. The solution also helps head office train new managers. "When I'm training a new District Manager, I can easily dive into examples of forms for other Managers, so he or she can see first-hand how to carry out this activity," said Oliver. Kellogg's sales managers use a custom Flowfinity store visit app to document in-store conditions on visits with their employees. Managers can easily load in the relevant store from a master list of stores on-device, online or offline. Once data such as the store and time in are entered, the manager can walk around the store and look for sales opportunities, well-executed displays, or issues needing attention such as out-of-stocks. Perfect store conditions include having the back room right, orders set up properly, merchandising completed correctly, and other factors. "Flowfinity helps us take the guesswork out of sales performance and ensures stronger in-store execution." "Now we can quantify what affects sales, whether it's lack of selling by the sales rep, or something store-specific thing such as low traffic or sell through," said Baker. "Flowfinity helps us take the guesswork out of sales performance and ensures stronger in-store execution." The information is fed back into other perfect store metrics and reviewed regularly along with other components such as saleables and returns. "Flowfinity is an all around great business tool that gives us excellent visibility into anything that's going on in a particular store," said Baker. "It's much more applicable to what we are doing in the market than the previous paper form, because all of the relevant information that we need to gather is right in the app." Store visit information gathered in the field is aggregated in Flowfinity for reporting, and combined with other metrics to enable informed decision-making that drives sales. The insights gained in Flowfinity go beyond the individual sales rep's performance, and can be accessed by various management levels within the sales team. For example, when store visit results are submitted from the field, the records are available to Zone Managers at head office for review. "With access to the information gathered in Flowfinity, our Zone Managers can take a deep dive into how our District Managers are managing their staff, and ensure they are carrying out the proper coaching," said Oliver. Flowfinity has made it easier for managers to document sales activity, since all the information they need to access and enter is available on their mobile devices. The result is better usage and documentation of field sales activity and store conditions. "Since implementing Flowfinity, managers are performing more 'Store Visit' and 'Work With' reports, which gives us better insight into factors that affect sales," said Oliver. "We are seeing much better results and more accountability using Flowfinity. There is a lot more documentation in our system now than ever before." Flowfinity mobile apps enable us to measure the performance of our field sales reps, capture in-store conditions, provide valuable feedback, and improve retail execution to optimize sales.